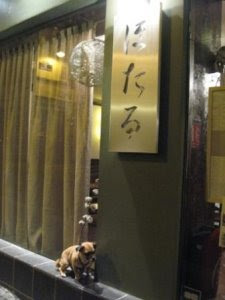 Paris Restaurants and Beyond: Hotaru - Wait, I Didn't Say 'Simon Says'! Hotaru - Wait, I Didn't Say 'Simon Says'! Although I'm not quite ready to challenge noted French restaurant critic Monsieur Francois Simon to a duel, I feel that maybe he at least owes me a drink. A very big drink. Being the ever-compliant and exuberantly fledgling critic that I am, I duly loaded up my credit cards and proceeded to check out the culinary wonders of two of Simon's recent 'don't miss them' Parisian eating establishments, Le Baratin (panned here a couple installments ago) and, last week, Hotaru, the relatively new Japanese restaurant in the 9th. 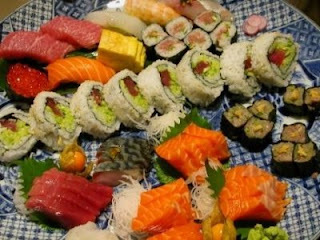 • The waitresses are lovely, but not easy to communicate with if you don’t speak Japanese. But I'm jumping ahead of myself. This was another solo affair on my part, again having planned dinner before a concert. I arrived shortly after the 7:30 pm opening time to find an Asian couple well into whatever they were eating - a large platter of some kind of fresh fish. By the time I packed up and left, around 9:15 pm, they were still ordering large platters of sushi and sashimi, washed down with pitcher after pitcher of, I presume, saki. I shudder to think of their bill, which had to hover well over the 200 euro mark. But I must admit, those platters looked mighty tasty. At the outset, I humbly admit that I always have the feeling that I order wrong at Japanese restaurants. Having had plenty of opportunities to savor fresh raw fish in my long storied career as a diner, I usually opt for alternative dishes. And so I did at Hotaru. The menu itself was intimidating - long and complex and, don't forget, I didn't plan on spending the entire evening. So I took a shortcut and ordered completely off the little tabletop blackboard of chef's suggestions with its listings of entrees on one side and plates and desserts on the other. I am a big fan of tofu served in restaurants - one of the few opportunities I have to appreciate a dish that, in my opinion, is best served lightly fried on the outside and warm and soft inside (only rarely do I succeed at this in my own kitchen). Give me a well-prepared peanut sauce to accompany a large plate and you will find one happy camper at your table. There's a place in Baltimore, I could tell you about - disappointing in virtually every other category, but their tofu entree is memorable. But I digress. No surprise, then, I ordered the Hotaru tofu entree (9€), and followed that up with a fresh scallops plate with Japanese salad, the so-called Hotate fry (21€). Ordering was no small chore. Remember Hesse's second con? Well, this turned out to be a con in more ways than one. I'm speaking of the wine. Try though she might, my waitress, with a limited facility in both English and French, seemed utterly perplexed by my question about whether I could order a half bottle of wine. Most restaurants, this is not a problem, and usually there are at least a couple demi-bouteilles on the carte. As she edged precariously closer to tears, she was rescued by another waitress who appeared to have a bit more seniority, as well as a few more words in her English and/or French (I can't remember anymore which) vocabulary. We arrived at a compromise. I would order a wine of my choosing by the glass, and before I would know it, I will have consumed a half bottle of wine. My big mistake, and I promise myself, it is a mistake I will not make again. I opted for one of my favorite reds, a St. Nicolas de Bourgueil (Les Perruches, 2006) at 7.50€ a glass. Before I had the opportunity to do my calculations in light of my projected consumption, I had already blown the chance to order a full bottle and save myself a couple euros in the process. Oh, well, you can't take it to your grave. The main dish was much better. The five pan-fried scallops with a light batter were good-sized and very fresh. They arrived on the same plate as a salad composed of a green lettuce and a white diced cabbage. It was difficult enough to have the waitress explain the sauce that came in a miniature pitcher. Sorry, but I can't explain her explanation (see Hesse's second con again). The sauce was relatively thick, but poured easily over the scallops and salad. I love sauces, virtually any kind of sauces, but this one was not completely pleasing, and a bit too salty for my taste (too much soy sauce again, I imagine). By the way, I almost forgot, again, as I failed to ask for rice when I ordered (assuming it would come with the dish). As she brought the scallop plate, the waitress asked, late as it was, if I wanted rice. Five times I had to repeat, 'oui, riz gluant, s'il vous plait.' Now my French is pitiful, but this is an expression I have had ample opportunities to practice during my years in France, so I think this would have been understandable to a two-year-old who knew anything about Asian food. (Pronounced, 'ree-glue-ahnt' am I right, or am I right?). But my waitress just didn't get it, and neither did I. If the rice I received was 'gluant' (i.e., sticky), it wasn't noticeable. I started wondering, as I dug into the scallops with my wooden chopsticks, what would have happened if I had suddenly grabbed my chest, fallen to the floor, and started moaning 'ee-ooh-ant,' 'ee-ooh-ant'? Probably someone would have excitedly shouted, 'my word, this man needs some riz gluant!' Now my riz gluant request was much more comprehensible than that, so you wonder, what was my waitress's problem? Although I hadn't originally intended to order dessert, given time constraints, I picked up quite a few extra minutes with that entree quickie and so I ordered the tantalizing green tea cheesecake dessert. Well, this turned out to be pretty interesting, although nothing like ecstasy-inducing cheesecakes I'm more familiar with back in the States. Two small triangles of green cheesecake arrived on a plate with a ball of ice cream, a handful of large grapes, peach slices, and a small mound of something sweet and brown that was never explained, but worked in the overall scheme of things. An interesting effort and a decent, though unspectacular, end to the meal. The L-shaped dining room consists of about 30 seats and a bar. 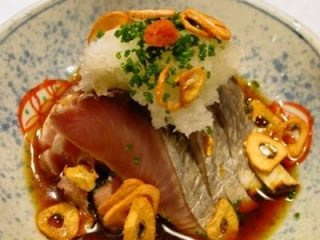 As described at the Internaute website, the room bears an ambiance "izakaya" (bistrot japonais), warm and sympathetic. Izakaya is another way of saying the spartan dining area is unobtrusive and uninteresting, especially when most of those 30 seats are empty, as they were during my visit. Only one other couple arrived during my meal, although perhaps this is the sort of place where people wander in well after 9 pm, I can't say because I was long gone. Where is your clout, Monsieur Simon? So that brings me to the final point, the con job I alluded to earlier. After having downed approximately 2-1/2 glasses of wine from the bottle, duly left on the table, I was charged 22.50€ for three glasses, a price I am more used to spending for a full bottle. I have no one to blame but myself for letting myself fall into that little trap. Nonetheless, my credit card would have suffered a much more substantial blow had I opted for one of the several rice wines listed on the menu. If you have to ask the price, then forget about ordering one of those. The glasses of wine helped jack my total bill up to 66€ (see Hesse's first con).